Frenched racks are one of the fancier cuts of meat and we carry several varieties. But sometimes you don’t want to make a crown roast or cut rib chops. Sometimes you want something with all the bones out, a loin. It’s very easy to separate the loin meat from a rack. 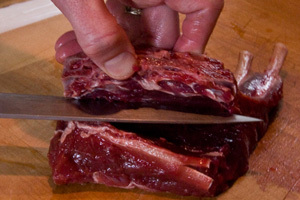 Follow bones down with edge of blade, peeling meat back as you repeatedly scrape across the rack. Remove the inedible silverskin – Poke the tip of your knife under the silverskin at one end and pull your knife across it while lifting skin up and angling blade up toward the silver skin to scrape as much meat off as possible. You may have to do this multiple times, removing multiple strips, especially when you’re doing it for the first time. 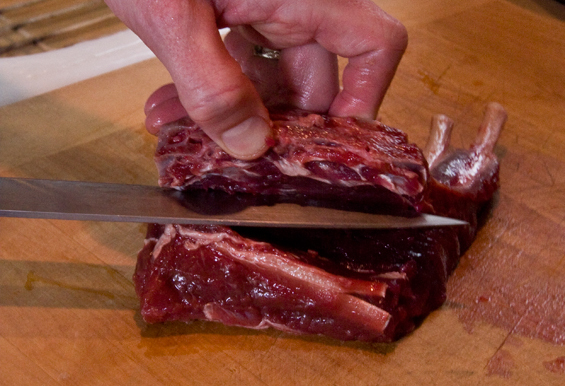 This technique can also be applied to lamb racks, wild boar racks, and kurobuta pork racks. This helps me getting the silver off a beef tenderloin even though it doesn’t have a bone in it. Now I see. Thanks. Lynn A.